Assassin's Creed is generally considered to be a solid, if somewhat flawed, videogame. Despite earning praise for its visuals, concept and unique story, the 2007 title was criticized for its repetition and tendency to bore players after significant periods of time. Fortunately for Ubisoft, Assassin's Creed became an unexpectedly huge success, and the series now has a chance to fix its problems. Assassin's Creed II definitely sets out to address the problems found in the first game, and the once-repetitive game is now a sprawling, quasi-open-world adventure full of variety. However, as old problems are tackled, new ones sprout up to take their place. Does Assassin's Creed II solve old issues while successfully maintaining control of new ones, or does it try to do too much at once and fail on all counts? Read on as we give this game the full review. Assassin's Creed 2's plot is just as contrived as the last one. In case you're unaware, you play as Desmond Miles, a man whose ancestry is riddled with notorious assassins. When strapped into a magical chair known as The Animus, Desmond can replay the memories of his ancestors for wonderfully convoluted reasons. Having escaped capture by Abstergo Industries, Desmond meets up with some modern day assassins who put him in a new Animus so he can relive the life of Ezio Auditore da Firenze and train to become a killer in a matter of days. As usual, the rather embarrassing Animus stuff seems tacked on, pointless and totally unnecessary. 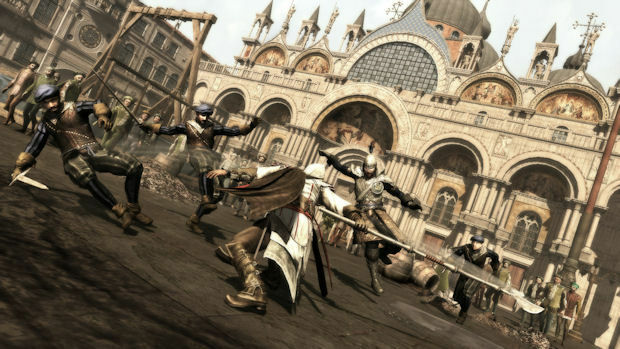 Most of the game is set in Ezio's time period of 15th Century Italy, and players will control Ezio as he attempts to foil a plot that seems ripped right out of The Da Vinci Code. While the story is mostly forgettable, a few of the characters threaten to be likable, and the scripts humor occasionally hits the mark. It just would have been so much better without the pretentious sci-fi stuff. It's really nowhere near as clever as it thinks it is. 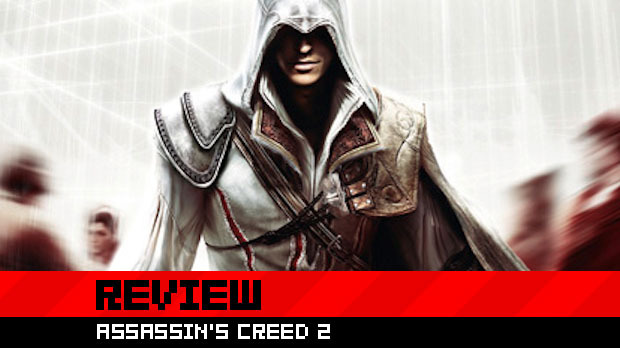 There is no denying that Assassin's Creed 2 is a far bigger game than its predecessor. However, Ubisoft has most definitely cheated in this regard, employing some of the cheapest time-wasting methods in the book to drag the game out to tedious lengths. So many of the new missions are pure filler, with a number of them literally consisting of walking around town with nothing else to do. You just follow a character slowly around a portion of the city and that's it, mission done. Some missions consist of climbing up a building and climbing back down again, all in order to find out something that could have been explained with half a minute of dialogue. Sure, there is more variety than the last game, but it is still repetitive as Hell and feels incredibly boring. 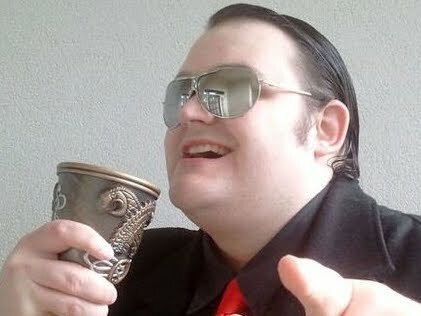 The game tries to be Grand Theft Auto, offering all sorts of optional missions, but those missions are taken from a stock of three or four variants, and take the form of incredibly unimaginative tasks such as "race this guy" or "hit this guy a few times." To its credit, Assassin's Creed 2 does have some really good moments. The game's chase missions, where you have to pursue a fleeing target and eventually run him through, feel incredibly cinematic and have been scripted remarkably well. The sequence where Ezio rides Leonardo da Vinci's flying machine is a terrific change of pace, and every now and then an assassination mission will lead to a considerably satisfying conclusion. However, these great moments are spread too thinly over the game's long running time, strewn few and far between by busywork and missions that have absolutely no point. So much of the game is spent running from one place to another, performing incredibly dull missions that tend to involve little more than climbing and jumping around, taking part in excruciatingly boring environmental "puzzle" levels, and getting bogged down with unnecessary loading screens and needless cutscenes that show levels being rendered by the Animus for no good reason whatsoever. If you know you've stuffed up a timed mission, there is no option to simply restart the mission. You have to let the timer run out or abort it and sit through the pre-mission unskippable cutscene again. Little things like that are used to rack up the gameplay hours, and they contribute nothing of worth to anybody. Even worse, the game needlessly forces the player to drearily wander the map at certain points. Players cannot simply travel speedily from one city to the next, instead having to first find a "fast travel" station. This is incredibly annoying due to the fact that Ezio's base of operations has a treasure chest that fills with gold regularly, and the only way to get to it is to trudge all the way back to the town to collect it. Little timewasting objectives like these are strewn about the game. Convenience is an afterthought in Assassin's Creed 2, and every little task is made to feel like a huge undertaking. It doesn't help that the game's minimap is horrible, and Ezio is so slow and ponderous when it comes to climbing buildings that it's simply not fun to get from A to B. It doesn't feel worth the effort of exploration to see everything that the game has to offer. Ubisoft may have varied the gameplay, but all the variations are just as dull as anything in the prequel, to the point where a simple rehash of the first game would have been preferable to all the filler and fluff that bogs down the AC2 experience. 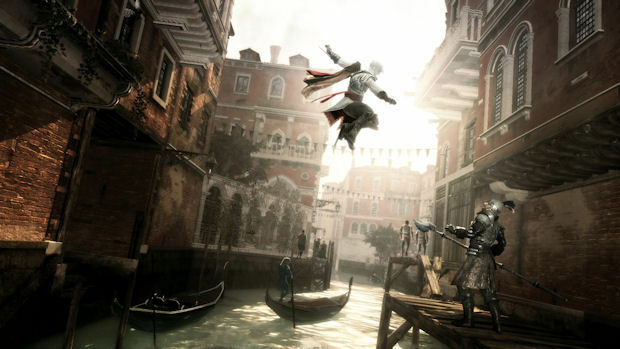 Ezio controls very much like Altair did in the first game, conforming to Ubisoft's "one button does ten thousand things" approach to development. 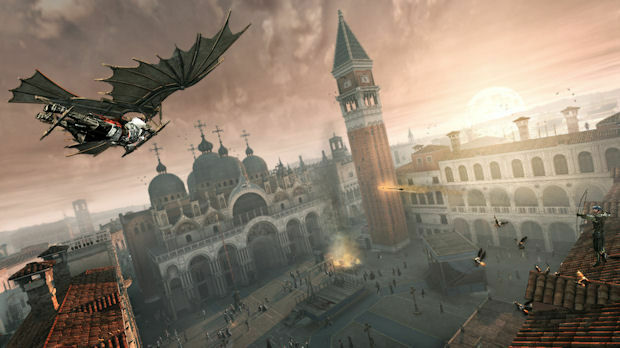 By holding the trigger and A, Ezio will freerun around the game's many cities, bouncing from poles, climbing buildings, and leaping from rooftop to rooftop. When the parkour works, it works out great, but unfortunately it's often a case of Ezio leaping to his death, randomly clinging to things you don't want him to cling to, and generally acting like a hyperactive monkey that's been injected with sugar. The main trouble is Ubisoft's attempt to make single buttons perform too many actions. In theory, the control scheme has been simplified to provide more accessible play. In practice, however, it's like a DS game that uses the stylus for everything. The game is confused by one button performing so many actions, and sometimes has to simply guess what you wanted to do by using the context at its disposal. Coupling this with Ezio's love of taking longer than he should to climb up things, and you have a very irritating experience that does not feel as flowing and impressive as it should. The blending, at least, is a fun and successful addition to the game. 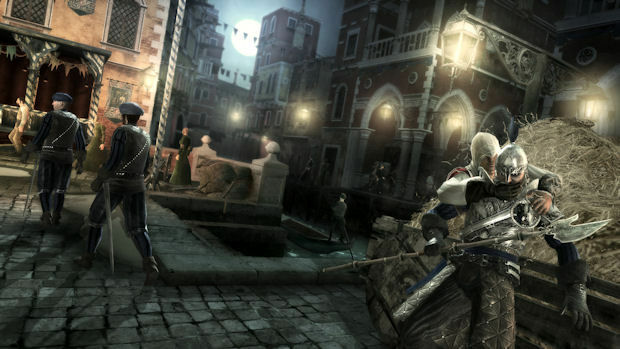 As well as hiding in crowds, sitting on benches, and hiding in haystacks like his predecessor Altair, Ezio can hire courtesans, thieves or hired knives to distract guards and allow him to slip by unnoticed, as well as throw money on the ground to create a handy disturbance. When he becomes notorious and more easily spotted by guards, Ezio will have to remove "wanted" posters, bribe heralds, or kill officials to clear his name. However, while Assassin's Creed 2 gives you more to play with in terms of blending in with the crowd, it's still fairly limited. Once you've hired and used one distraction, you've hired and used them all, and wandering around looking for heralds or posters gets fairly tiresome. Still, watching courtesans lure some horny guards away from a post rarely gets old. One major sub-quest is the renovation of Ezio's base town, Monteriggioni Villa. Ezio can invest his money into the renovation of the town, improving certain buildings to increase Monteriggioni's value. When the value goes up, Ezio earns a bigger kickback from the town's profits. He can also renovate shops to get a discount on equipment, new clothing, or healing items. The whole idea of improving the town and earning a steady income is great, but as usual, it's let down by pointless ponderousness. In order to receive your earnings, you have to travel all the way back to Monteriggioni itself, finding a fast travel station, sitting through a loading screen, and then walking from one end of the Villa to another to find that treasure chest I mentioned earlier. To make this even more annoying, there is a limit to what the treasure chest can hold, effectively forcing players to drop what they're doing and march back to the Villa if they want to keep making money. There is absolutely no reason for this decision, other than to falsely extend the game's running time. Combat, at least, is relatively decent. 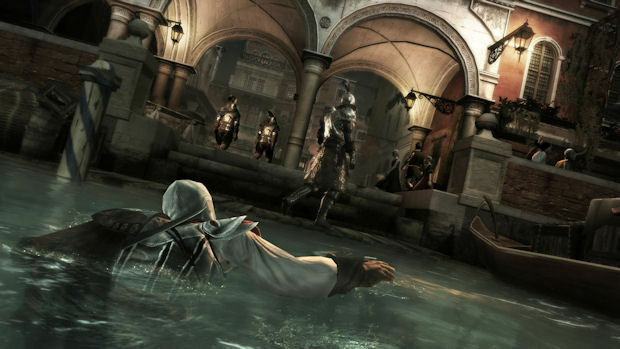 The counter-attack system works terrifically, with Ezio able to pull off some pretty slick finishing moves when timing the attack correctly. He can also dodge, taunt, grab enemies to throw them or slit their throats, and disarm enemies to use their own weapons against them. 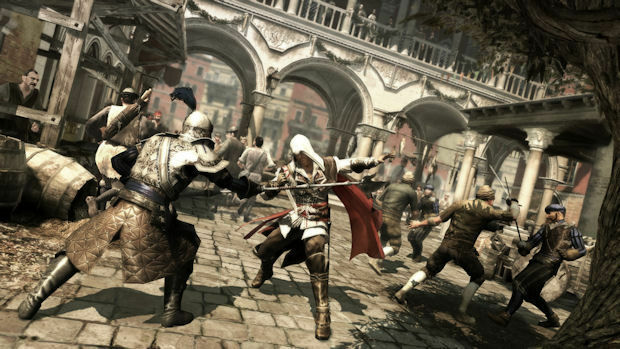 Ezio can throw dust off the ground into an opponent's face, or he can get behind an occupied foe to finish him off with a brutal back attack. There is a lot of variety in the combat, and quite a few different enemies that require their own tactics to beat. It's just a shame that the enemy AI is absolute crap. Enemies will gather round you and do nothing for a very long time, simply content to stare at Ezio's ridiculous clothes. 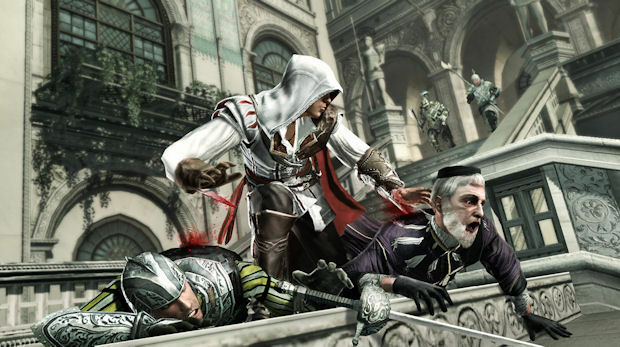 It's also hard to employ stealth in the game and make use of Ezio's various assassination kills, thanks to the unpredictable opponents that will sometimes be oblivious to your movements, and sometimes have the perception of a telepathic owl. Speaking of absolute crap, I don't know what Ubisoft has done to the game's engine, but Jesus Christ is it bad. This game has some of the most puzzlingly bad graphics I have seen on a console this year. The facial animation in particular is abhorrently nightmarish, with characters looking like circus freaks and moving as if they were bizarre puppets in rubber flesh. One particular female character looked incredibly hideous and old, and I assumed that was the designers' intent. Imagine my surprise when one of the characters -- completely sincerely -- describes her as "young and beautiful." Not a single character looks "beautiful" in that whole game. All the women look like David Bowie after taking a frying pan to the face. The animation is pretty piss-poor as well. One cutscene involved a character being kicked by another in a supposedly brutal fashion, but it more closely resembled two very bad actors in a poorly staged fight. The hit detection is totally off the mark, with Ezio's fist usually an in-game foot away from someone's face while they're reeling from the implied punch. Professional wrestling matches have more realistic combat than this. There is also plenty of pop-up and textures that appear out of nowhere. While the draw distance is superb at long distances, it's terrible for short ones, and as far as I'm concerned, being able to see everything that's close to the player character is slightly more important than seeing stuff ten miles away. The game simply looks sub-par and unpolished in so many areas, which totally undoes the otherwise bright scenery and impressive vista visuals. Oh, and every single time Ezio performs an important assassination, the camera zooms in close to show his hand completely clipping through his victim's head. So much for impact. Assassin's Creed 2 has tried all sorts of tactics to improve upon the original, but none of these attempts have worked. The game's variety and length come across as nothing more than smoke and mirrors, the endless, grinding busywork that contributes nothing to the overall gameplay is inexcusably plentiful and mind-numbingly repetitive, and to top it all off, the game can't even compete in the visuals department and somehow looks worse than the original. There's really no excuse for standards to be so low here. Assassin's Creed 2 is supposedly a triple-A game. It should have acted like one.